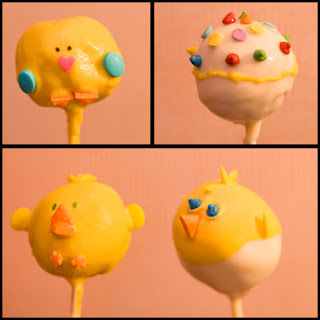 Jill Made It: Cute Cake Pops! So these are my first attempts at the cake pops. (Not including the ones that fell off their sticks--oops!) I can't say they were easy, but I do think that, once I get the hang of them, they won't be hard. And they're delicious and adorable, so I'm definitely going to make more of them! Update: Here's a link to Bakerella's basic instructions for making the cake pops. Browse around her site for lots of cute decorating ideas!